Celebrate the end of the first week of the First Session with "Mike's Data People"! Instructor Mike Hawthorne has organized a meetup for instructors, TAs, & participants looking to relax and have fun on the Dominick's patio. Karaoke starts at 9 p.m. at this popular downtown bar whose strange decor includes clowns and circus animals. 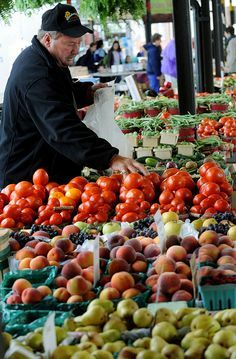 Saturday, 6/25, opens at 7 a.m.
Buy fresh fruit, veggies, baked goods, eggs, and a delicious variety of foods from dozens of local farmers and producers. Join your fellow participants, as well as instructors and TAs, for lots of food and fun! This free summer festival features live music, food from local restaurants, and a beer tent. Just north of downtown, the Huron River is a wonderful way to relax and cool down. The Argo Canoe Livery rents kayaks, canoes, tubes, paddleboards, and more.